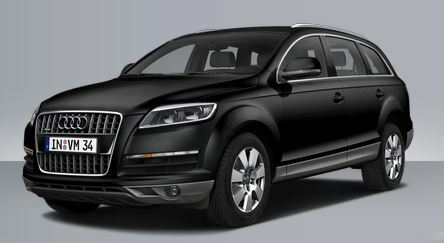 Audi’s Q7 SUVs have been highly popular ever since their first incarnation. Now Audi have made the latest version of these luxurious and practical vehicles available with a petrol engine – because diesel isn’t for everybody, after all. The Audi Q7 Petrol is powered by a three-litre TFSI engine. For those who are less familiar with Audi’s trademarked terminology, TFSI stands for “turbo fuel stratified injection”. In other words, this is a turbocharged engine that forces fuel into the combustion chamber to produce a “stratified” charge. A stratified charge, so they tell us, allows for a higher compression ratio and a leaner burn (less fuel needed with the same amount of air as a conventional engine). This translates to better fuel economy and more torque from your petrol engine – a real win-win situation if there ever was one. So how does the TFSI engine in the Audi Q7 Petrol stack up? In the torque department, this engine is capable of 440 Nm of twist in the 2900–5300 rpm range – the sort of figures we’re more accustomed to seeing with diesel engines. This is backed up by the power figures: 245 kW in the 5500–6500 rpm range. In short, this engine is going to give you excellent acceleration (it does the 0–100 km/h sprint in 6.9 seconds) and you are going to be able to tow just about everything the typical household needs to (or even the untypical household, given that not everybody has to tow a horse trailer on a regular basis). The Audi Q7 Petrol has a braked towing capacity of 3200 kg, which is enough to lug about a rhinoceros. In the fuel economy department, it has to be remembered that fuel consumption is always going to be somewhat on the higher side in a larger, heavier vehicle like the Audi Q7 Petrol. However, for a seven-seater SUV, it stacks up pretty well with a combined fuel economy figure of 10.7 L/100 km. The TFSI engine in the Audi Q7 Petrol is coupled to all four wheels (the famous Quattro drivetrain, of course) via 8-speed tiptronic transmission. The driver of the Audi Q7 Petrol gets to play with the gears in this smooth system however he or she fancies, and the tiptronic system allows the driver to opt for a sporty driving style if preferred. To look at, the Audi Q7 Petrol is everything that we’ve come to expect from this prestigious German marque. The curves of the silhouette put the “sport” in “sports utility vehicle”, being reminiscent of a coupé. The overall looks are modern and bold, but the thing that most other drivers will notice when you zoom past them in your Audi Q7 Petrol is the lights: it’s fitted with LED daytime running lights to complement the Xenon Plus headlights, and the designers have really had a lot of fun with these, with quite beautiful results. The rear lights also use fuel-saving LED technology – and, like all LED lights, look amazing. Even the practical touches in the Audi Q7 Petrol look good, especially the aluminium-finish roof rails. This blend of practicality, style and luxury continues on the inside of the Audi Q7 Petrol. Cricket leather trim and aluminium inlays (echoing the exterior trim) are the standard trims, although if you want to pay a tad more, wooden inlays and Verano leather are available. The driver’s seat and the front passenger seat in the Audi Q7 Petrol has lumbar support and is electrically adjustable. The cabin is spacious, and a panoramic glass roof is available as an extra option for those who really like the feeling of openness. Information about navigation and the sound system are displayed on a 7-inch colour display screen that is integrated seamlessly into the cockpit. The Audi Q7 Petrol is nothing if not practical, so it’s been fitted with plenty of gadgets to assist the driver and keep all of the occupants happy during the ride. A lot of these are part of the active safety package, which incorporates ABS, ASR, EBD, EDL with an off-road mode, a roll stability program, brake assist and brake prefilling. For those of you who haven’t caught up with what all these abbreviations mean, they are, respectively, anti-brake skid, anti-slip resistance, electronic brake distribution and electronic differential locking. These combine with the famous Quattro four-paw system (and the speed-sensitive power steering) to give great on-road handling and comfort. Around town, other driver aids come into play, such as the Audi parking system and the reverse camera. Comfort is taken care of with the deluxe automatic air conditioning, and the electrically opening and closing tailgate is another nice touch that will be especially appreciated by the families who are likely to be in the queue for the Audi Q7 Petrol. Other little touches to keep you happy include the 108-watt 11-speaker sound system, the Bluetooth interface with audio streaming and the hard-drive navigation system. If all these standard features in the Audi Q7 Petrol aren’t for you, there are some option packages available: the Technik (includes front cameras, BOSE surround sound and four-zone climate control), the Infotainment (BOSE surround sound, rear seat entertainment, privacy glass and digital TV reception) and the S-Line (an extra sporty exterior body kit and badging, plus sports shift paddles). Discuss these with your nearest Audi dealer if these sound like you. For any more information on the Audi Q7 Petrol, or for that matter any other new car, contact one of our friendly consultants on 1300 303 181. If you’d like some fleet discount pricing (yes even for private buyers! ), we can submit vehicle quotes requests out to our national network of Audi dealers and come back with pricing within 24 hours. Private Fleet – car buying made easy!